Whitney Vickers | Greene County News Approximately 12,000 individuals are expected to participate in the Air Force Marathon Sept. 15. Kicking off Air Force Marathon weekend was the annual Sports and Fitness Expo, in which a number of fitness and nutrition vendors set up at the Wright State University Nutter Center. 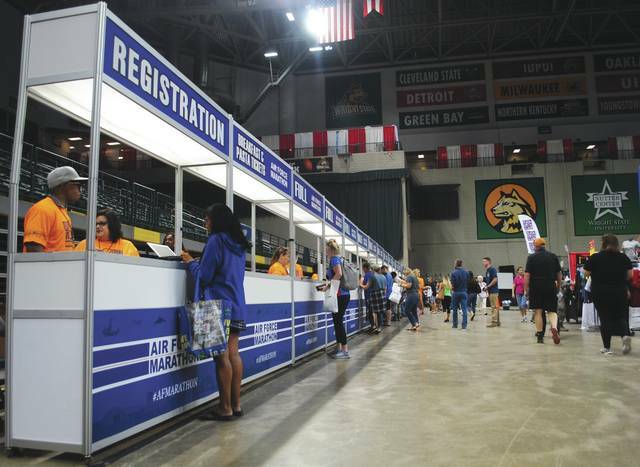 Individuals were additionally invited to pick-up their race bibs and t-shirts at the expo. Wright-Patterson Air Force Base Commander Tom Sherman and Tailwind, the official Air Force Marathon mascot. Approximately 12,000 individuals are expected to participate in the Air Force Marathon Sept. 15. Kicking off Air Force Marathon weekend was the annual Sports and Fitness Expo, in which a number of fitness and nutrition vendors set up at the Wright State University Nutter Center. https://www.fairborndailyherald.com/wp-content/uploads/sites/50/2018/09/web1_fitnessexpo2.jpgWhitney Vickers | Greene County News Approximately 12,000 individuals are expected to participate in the Air Force Marathon Sept. 15. Kicking off Air Force Marathon weekend was the annual Sports and Fitness Expo, in which a number of fitness and nutrition vendors set up at the Wright State University Nutter Center. 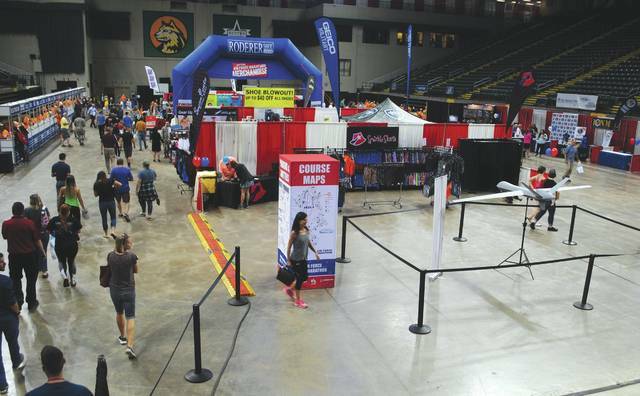 https://www.fairborndailyherald.com/wp-content/uploads/sites/50/2018/09/web1_fitnessexpo1.jpgIndividuals were additionally invited to pick-up their race bibs and t-shirts at the expo. 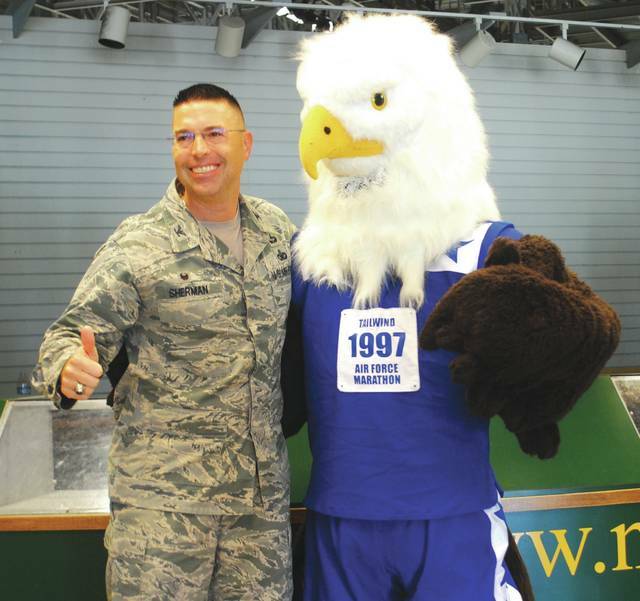 https://www.fairborndailyherald.com/wp-content/uploads/sites/50/2018/09/web1_fitnessexpo4.jpgWright-Patterson Air Force Base Commander Tom Sherman and Tailwind, the official Air Force Marathon mascot. 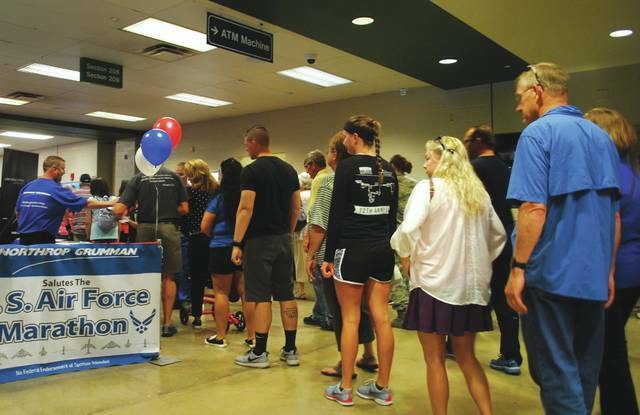 https://www.fairborndailyherald.com/wp-content/uploads/sites/50/2018/09/web1_fitnessexpo3.jpgWhitney Vickers | Greene County News Approximately 12,000 individuals are expected to participate in the Air Force Marathon Sept. 15. Kicking off Air Force Marathon weekend was the annual Sports and Fitness Expo, in which a number of fitness and nutrition vendors set up at the Wright State University Nutter Center.